My mother died of breast cancer in 1989. She was 44. Ironically, she was considered a “survivor” because she lived for five years after diagnosis. She was a teacher and during those five years, she never missed a day of school. She saved the summers in between for chemo, two rounds of radiation and a mastectomy, all at famed MD Anderson Cancer Center in Houston, which was considered then and remains today one of the world’s premier cancer treatment facilities. So what has happened in the almost 30 years since? Yes, there is a decline in the mortality rate – for less than 5 years. As grateful as I was for those five years, I would have liked to have 20 years or more. 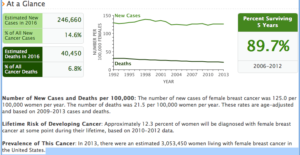 I’d like to know that today much fewer women get breast cancer. 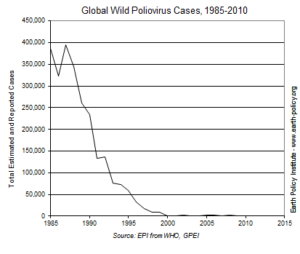 I want it to look like this chart of polio occurences. That makes me pretty demanding too. Cancer is tough stuff. Many brilliant minds and passionate hearts have dedicated their lives to research of the disease and care of its victims. Is it too much for anyone to figure out how to cut the numbers? In my years of work in resourcing individuals for worldwide mobilization, the numbers represent people, I realize that each node has excruciating significance. Who is that specific person that melts into those numbers? Was it your mother or aunt or sister? Did they live less or more than the survival 5? We live by statistics. We toss around the words “average” and “normal” more commonly and casually than their less technical counterparts “mostly” or “seldomly.” We actually abuse statistics, using it to create desired response. Politics report crime is down or up X% to catch your vote; business marketing emphasizes attributes and effects skewed to get you to buy; teeth are Y% brighter or items contain Z% less calories. The media wants to grab your attention and activists want to prove their point. It’s the notorious tail wagging the dog. Data collection, data sets and data analysis are manipulated with ignorance or intent to provide facts and figures that support a cause. Even without using statistics, our brains are wired to measure risk in ways that are often unrealistic. We assess situations trying to find cause and effect relationships when actually only coincidence is present. We perceive great risk where there is little (shark attack), and we underestimate potential dangers (driving to the grocery store). What does cancer look like to the “average” victim today? A diagnosis via testing, a specialist doctor, and a suite of supporting consultant experts and services. A team is built to craft a treatment. This is goodness but it’s not the best we can do. In this Ted Talk, Kristin Swanson explains her personal journey with cancer and the cold hard numbers. Two heads are better than one, and a whole team behind you definitely improves your odds. Going back to the stadistics, though how much has that made a difference? Medical school is not walk in the park; it is notoriously long and rigorous. I imagine the volume, velocity and variety of information learned in medical school has grown exponentially from even just two generations ago. Although the human body itself hasn’t changed (appreciably) in a couple thousand years, the amount of research compiled about body parts, human habits and social environments again expanded in quantity and quality in the past two generations. But that is small data. Kristen gives the example of Patient X whose tumor is larger after therapy. In a small data world, this is a “failure.” Therapy => larger tumor => failure. In reality, had Patient X been the famed “mean” participant, his life expectancy would have been 15 months. This Patient X lived another five years. So where is the true failure? This doesn’t mean doctors are wrong or idiotic about their techniques and therapy recommendations. These physicians are compassionate and intelligent resources for developing appropriate therapy according to standard practices. Unfortunately, they are making life decisions for patients with relatively very little information that is very biased. Comprehending the intricacies of the infinite array of influences that affect a single person’s holistic health profile is impossible psychologically. Humans (at this stage of evolution) can only hold so many numbers in their brain and then the matrix of combinations thereof quickly pushes override. Even if doctors could study harder or lean harder on tried-and-true practices in an attempt to maximize survival, it is still small data. Tackling Big Problems – such as cancer – has been looking for those car keys. What we know about cancer is under the streetlight. The complexity of cancer and other Big Problems has been beyond the tools and capabilities we have been utilizing. In comparison, polio and small pox were not complex; they were complicated. In these situations, enough experiments and enough coincidence unraveled the mystery and a vaccine was borne. This scenario is likened to untying the ear buds that were wadded up at the bottom of a backpack. Patience and grit win the day. Neither polio or small pox are even curable, but they are preventable. That prevention significantly dropped mortality rates. 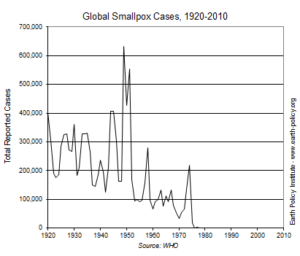 Small pox was even considered eradicated from the earth in 1980. Big Problems need Big Data. Big Data’s capability has only come into play within the past ten years. Its nascent tools are just evolving. The information of the world previously has been only ether, captured in memory through unreliable replication or in select recording capability of finite data points. Now it is being captured in ways and means –subtle and overt – that even the most creative imaginations didn’t predict. Big Data is possible now for a couple of reasons. Data acccomodation was limited in a small data world but now digital capture has created an expanding flow that is not only easily made, but also sharable and searchable. Punch cards and floppy disks were the beginning of the end of small data. Storage is just the first tenet. The power to manipulate the data is keeping pace with capacity. The cell phone of 10 years ago (think flip phone) had more power than what was possible for the Apollo missions to the moon. Today’s typical work environment still relies heavily on spreadsheets and traditional databases, an abacus of sorts relatively. This gap between what is possible with data that is collected and what is done with it sets up the huge demand signal for data scientists. We need intelligent people who can manipulate Big Data. Finally, Big Data needs to be articulated – art meeting science. Data scientists are needed for accuracy and intent but the expression needs a handshake with the operators of the information. In the case of cancer, this is doctors and specialists and caregivers. Data visualization rounds it out because the reasonings and relationships are far more coquette and piquant than dashboards and powerpoints. Big Data is complex – not complicated. It’s chaotic. The earbuds cannot be unraveled; they continuously contort with each pull of a knot. Each of us carries around genetic predispositions which are either enhanced or deferred with the daily choices that compound into life time patterns and twist with chance events. How much you weigh or what you eat or drink or where you live or how you work or play or where you travel or stay put or how you relate to friends, family and coworkers – these all interplay until a tipping point is reached. Big Data captures the minutiae of internal gyrations and external influences affecting that probability of cancer. Big Data is where the breakthrough lies. Since Big Data has become a capability, we can go beyond treating the mean. A cancer treatment need no longer be determined by your doctor, or a suite of doctors. It can be determined by all the doctors who have ever treated cancer. A patient’s medical history isn’t a couple of pages of discrete data points. It is a continuous flow of information illuminating personal habits, events, and discretions. All the dedication to cancer research folds into Big Data. Big Data is not a Holy Grail of itself. Big Data helps us see information in a way never before capable, evolving a holistic methodology. With that power comes great responsibility. Like statistics, Big Data outputs can become ugly monsters or heavenly returns. Big Data can move the street lamp.